More proposals leaking from the White House, and this one may have teeth if for nothing else than "smart money" is acting in the bond market for Fannie and Freddie mortgage bonds. (by smart money, I of course mean people with inside information and who apparently can freely trade on it - ahem). Aside from the previously mentioned national landlord proposal [Jul 22, 2011: Washington D.C. as Nation's Landlord?] it looks like the powers that be are considering throwing (nearly?) everyone who has a government backed loan the opportunity to refinance at current rates. That would work wonders, especially if 'Operation Twist' can drive those 30 year rates to sub 4%. Of course those who do not have government backed loans miss out, but fairness is not really something considered during the past 4 years as 'solution' after 'solution' is thrown against the wall to see what sticks. While many households have refinanced the past few years - creating a lot of extra free cash flow - this would definitely be a stimulus. People who are underwater and delinquent obviously cannot refinance - unless Uncle Sam says so. (HARP already allows those who have 125% Loan to Value to refinance, so next we can capture those at 140-160-200% I suppose) At current rates, this story estimates a savings of $85B to Americans annually, which would be less than the 2% payroll tax holiday - but that's going to be extended as well (if not expanded). One proposal would allow millions of homeowners with government-backed mortgages to refinance them at today’s lower interest rates, about 4 percent, according to two people briefed on the administration’s discussions who asked not to be identified because they were not allowed to talk about the information. They are also working on a home rental program that would try to shore up housing prices by preventing hundreds of thousands of foreclosed homes from flooding the market. That program is further along — the administration requested ideas for execution from the private sector earlier this month. 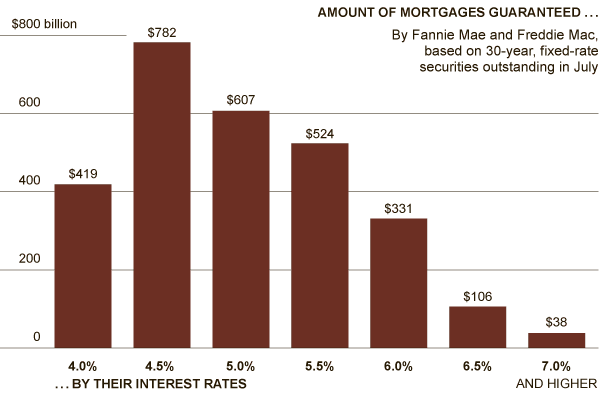 But refinancing could have far greater breadth, saving homeowners, by one estimate, $85 billion a year. Despite record low interest rates, many homeowners have been unable to refinance their loans either because they owe more than their houses are now worth or because their credit is tarnished. More than one in five homeowners with mortgages owe more than their homes are worth. As of July, an estimated $2.4 trillion in mortgages backed by Fannie and Freddie carried interest rates of 4.5 percent or higher. Exactly how a refinancing plan might work is still under discussion. It is unclear, for example, whether people who are delinquent on their mortgages would be eligible or whether lenders would administer it. The idea is appealing because it would not necessarily require Congressional action. And... in an oligarchy it is important that the oligarchs support the plan. Our banks do! .... banks prefer the refinancing plan.